Ever wondered what it would be like to have a theme song whenever you fought something? Much like the first 2 seasons, this one kicks out of the gate like a bat out of hell. The premise of Symphogear is one much like your magical(techno) girl plot; however, in this case the power is derived from relics that are only activated by song. This makes for an amazing experience with an epic sound track (I might use epic a lot in my review...)! The characters (most of them anyway) are strongly developed with a lot of conflict and growth seen through all three seasons. I'm not overblowing this when I say that some of the combat witnessed is incredibly intense, with high powered abilities that make your jaw drop while simultaneously laughing incredulously at the power displayed by these girls. I sincerely hope CR can bring in all 3 seasons of the show; that would be phenomenal! In the meantime, however, this one is still turning out to be just as epic; no holds barred with the fighting and the feels! Side note: I highly recommend watching the other two seasons prior to this. While it's certainly amazing by itself, there's a lot of missed plot if you skip them. Season One can be found easily on another popular anime site (not sure if I'm allowed to name it in a review?). Season two (Senki Zesshou Symphogear G) is unfortunately harder to find; but I strongly suggest looking for it before firing this one up. The writing is not very strong in this show, and it's obvious that the writers aren't bringing their A game at all. Half of everything makes no sense and you can't go more than a couple of minutes before stepping into a plot hole. Nonetheless though, this series somehow manages to remain fun and entertaining. So let's get the bad out of the way, since it will be obvious to anyone watching this show. The writing for this show is definitely not its strong suit. Or rather, it's so glaringly bad that it makes me physically wince. You'll have characters arguing with each other over what's right or wrong using arguments that have nothing to do with anything. "You're nothing but a hypocrite because you're trying to save the world without knowing pain." "I'm going to strip you of all your power and abandon you in enemy territory and then later try to kill you a bunch of times and try to end the world because I don't want you to die!" " I'm going to trust this guy who captured me after almost blowing me up and kept me in a cage because he says he'll give me power!" "My friend got mad at me for keeping a secret from her and I promised not to do it again... so I'm going to do it again so that the opening scene makes sense and my friend can suffer some more!" "I've decided this evil doctor guy that keeps slapping me and my friends around and is about to destroy the world is a bad guy and that I should stop him, but I'm just going to lie here on the ground crying because he slapped me again despite the fact that I'm supposed to be a strong female character and have the physical ability to tear him apart without much effort!" These and more shining examples of characters not making any sense whatsoever will make you want to punch them for their idiocy. The writers are more than happy to screw the characters over for the sake of advancing the plot, and it really is very detrimental to the show. The songs... are hit or miss. Some of them are extremely bad, especially in the first season. Hibiki's songs also have a strong tendency to be reduced to shouting at certain points instead of singing, which sounds pretty bad. The lyrics are meant to tie in with the plot somewhat, but a lot of the lyrics are pretty bad and at times it seems the writers were forced into doing certain things to make sure the show still matched the song. The show is here to sell the songs, it's pretty obvious. It's merely a platform to serve as a big commercial for the songs and sell the singers/merchandising. It's unfortunate, but true. Most of the songs seem to have been written by the same person as well, since more than a couple of them sound the same in many parts and a bit more variety would have been appreciated. The writers also seem to hate America. I don't know why, but every appearance of America is to paint them as incompetent bad guys and/or to say they're wrong. I don't get it, and it feels very strongly like the writers themselves have a personal grudge against America and are using this show as a way to express their dislike. And that's okay to an extent since writing is meant to allow you to express stuff like that. But when it gets to the point that it's essentially being shoved into your face over and over like this, it just detracts from the series and shows how immature the writers can be. At a guess I would say that the writers have some sort of inferiority complex since what's shown here is almost textbook. The story also has a lot of loose ends that get mentioned and seem to be hinting at something but then are never mentioned again. It's pretty obvious that the writers are definitely being limited by something. I don't know whether it's budget (especially obvious in the first season), having to conform to whatever songs they are getting, or maybe just creative differences with the writers or maybe their bosses, but the plot just doesn't work very well at all. Things happen without explanation, characters all of a sudden know things they have no way of knowing, and deus ex machina all over the place. The story is just an absolute mess. The villains are hit or miss. The villain in the first season was pretty obvious, but at least she had an understandable motivation and had a proper resolution. The second season had an organization of wishy washy girls who made no sense half the time, and Dr. Ver who is the most over the top insane mad scientist I've seen in a while. Not very good villains really since they never seem to have a proper goal other than "to save the world" by doing... something that involves destroying it. And then they flip flop all over the place since the writers are trying to keep the girls sympathetic so their inevitable heel-face turn happens it won't seem like it's coming out of the left field, but it's handled so badly that it just makes the characters incomprehensible. The third season villains are definitely better done than the second season's villains, but are still not quite there. So why should you even give this show a shot? Well, some of the songs are actually really nice. I especially like Chris and Tsubasa's songs, and the duets are very nicely done as well. The action sequences also tend to be very cool and the directing for them is top notch. The show knows that what makes it sell are its songs and its action, and it definitely plays to its strengths for the most part. The animators are really on show here and while I feel that the director should have reigned them in a bit in some places (Dr. Ver's crazy faces O_o), you can really tell they're having fun with what they're doing. Tl;dr: Turn off your brain and enjoy the show for the ride it is. The plot is just there as an excuse for the characters to sing and fight, and most of the time the singing and fighting is done well. Don't watch if you want to pay attention to the story or are the type that gets irritated when the writers phone it in. It is quite required to watch the first two seasons before this one, but it's highly worth it for this action packed sentai-esque musical. This third season picks up where season 2 left off, bringing more eargasms and adrenaline than ever before. It definately takes away from the usual action grimes, Singing and beautiful vocals are what symphogear is great at! I remember watching Season 1 and was blown away, afterwards kept track of each season, until CR surprised me with S3, it's a shame S1 and 2 are not on here. It's kind of required to have watched this otherwise you will be lost in the sauce. This picks up right where 2 left off. And so far it's promising. 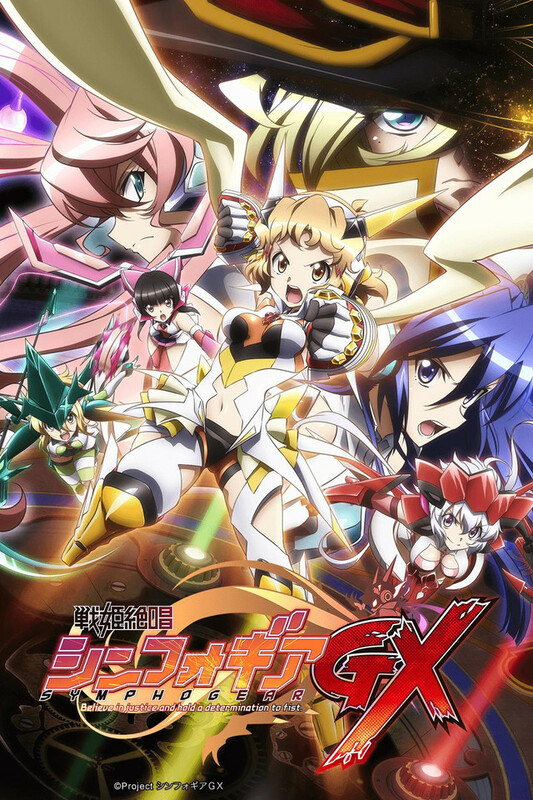 Kinda awkward that they only have 3rd season of Symphogear on CR. Anyways this is awesome series to pick up. High octane super power action with singing. Highly recommend to watch first 2 seasons before this one. The 3rd season picks up right after the ending of the second one. Bottom-line watch it, be happy, and prosper. So bad it's good? Just good? Symphogear is not a smart show. It will not delve into deep themes, have particularly interesting writing, or plot twists you can't see a mile away. Main character herself is a plot device that kind of solves every problem with "because Symphogear". The first part of the first season is a little weak. HOWEVER, it is, for lack of a better word, an awesome show. If you're a fan of insert song moments, this is for you. Even if you're not, this is probably for you. It's fun and dumb, and that's OK. To really best describe it, I guess I could just use a watched --> expected --> got. http://i.imgur.com/533HJ6l.png It's worth a try, at least. Also note that at the time of this review, the second season, Symphogear G, is not on Crunchyroll, so you will be lost if you go to GX after the first season. Symphogear is not the kind of show you watch for thought-provoking ideas, heart-wrenching drama or an innovative visual style. It is, however, the most gut-punchingly ANIME show I have watched in years, and one of the most straightforwardly enjoyable ones at that. Enjoyment of Symphogear rests on three pillars: The amazing music (if you've ever liked a song by Nana Mizuki, this show is basically that for three seasons), the cool fight scenes (especially from season two on, when the show gets a serious production upgrade) and, most importantly, the ever-escalating 'Did they really just do THAT?!?' factor. From the basic premise (schoolgirls fight with ancient relics using the power of song) it just keeps getting nuttier and nuttier, while playing everything 100% straight. In Symphogear, understatement is weakness, and every emotion must be expressed through singing, punches or singing punches. Dialogue features lines like "I hate singing. Especially my own, since it only brings pain" and "I neutralized the explosion using a martial arts technique", and nobody bats an eye at villainous plans involving reincarnated ancient sumerians blowing up the moon. If you want a subtle character drama, stay far, far from this one. If you want a fist made of singing blowing up a dragon, though, this show is for you. What's popular? Magical girls? Idols? Power of friendship? FUGGEDABOUTIT just combine everything together! You got some foolish duders saying "aw man cheesy dialogue", "predictable plot", "this garbanzo is not realistic", "protagonists never in real danger"
Do you like music and explosions? Now that all three seasons have been added, the show is absolutely a recommended watch. Symphogear is a rare series in the sense that it improves considerably from its first to second season, and the third has yet to fail me in any way (waiting for the last 2 episodes!). 1) Music, lots of it and of varied genres; techo, rock, pop, orchestral ensemble, even enka. Each girl has her own style of fighting and music to go along with it. 2) Lots of explosions. I don't think this needs any more explanation. 4) Entertainment, the show is simply worth your time. This really is one of those shows where if you enjoyed the first two seasons, then the third will not disappoint. The action is as good as the previous seasons, the music is great, and they did create a group of enemies that do feel like a threat to the main cast. It's a show that will be very over the top at times. In a sense you could consider it partly a magical girl show and partly just a super hero show. The idea of having the main heroes sing their combat songs in order to fight always stood out to me as a fun idea. Everyone has their own songs and styles which makes it interesting to listen to the episodes. It's a fun action series. The visuals as a whole are pretty good, though perhaps not the best you'll ever see. In a sense it's very by the book kind of show, but if you enjoy the kind of show this is then Symphogear won't let you down.